As usual April has been a very busy month here, with not enough time to get out into the countryside for photography. However, on the days we did get out, we were rewarded with some wonderful weather and equally wonderful flowers. We had intended to travel further afield this month, but we were kept very busy with flowers in Lassithi. A high spot of the month was a trip to Kew with John Fielding and Gareth Stanfield, where I was shown the new Alpine House and the alpine flowers of Crete in a London suburb. My photos of Cyclamen creticum and Paeonii clusii in their exalted surroundings can be seen at the end of the April calendar. 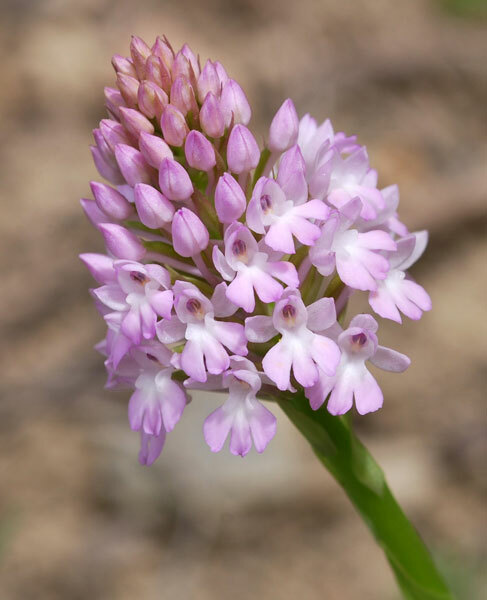 Anacamptis pyramidalis / Pyramidal orchid / Pyramiden-Spitzorchis (Hundswurz) - This pretty orchid is widespread throughout Europe and is common on Crete. Flowers vary from mid to pale pink, sometimes white. The white specimens are particularly attractive. 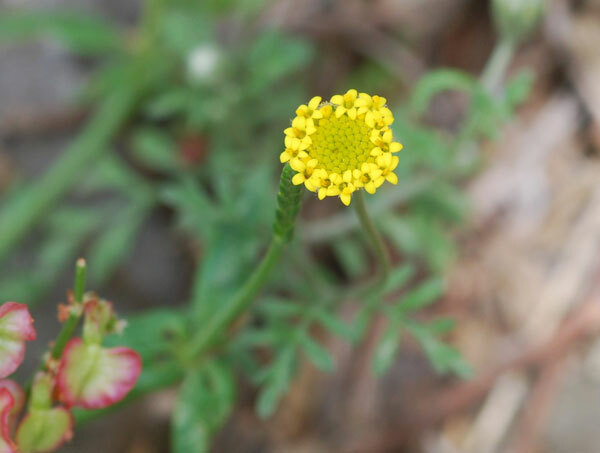 Anthemis tomentella - a vibrant, spreading anthemis, which is endemic to Eastern Crete. 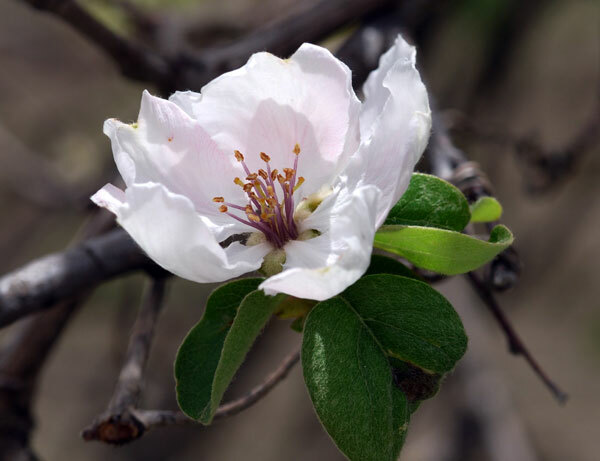 Apple Blossom on the Katharo - The Katharo Plateau in April is a wonderful place to explore and to look for flowers. This fruit blossom, which I think is apple, was so delicate and fragile and was a magnet for local bees. 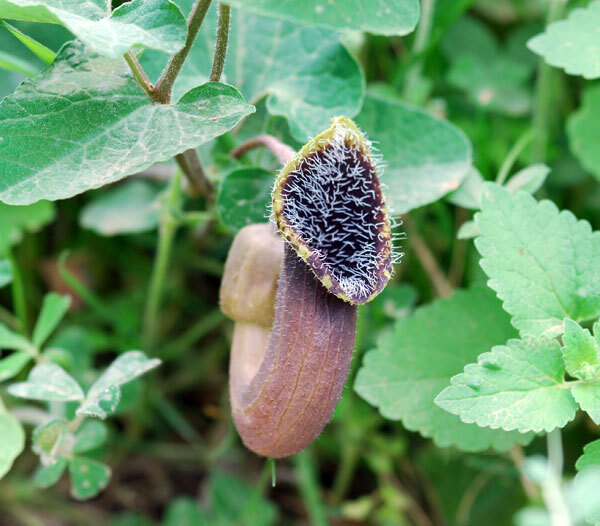 Aristolochia cretica / Cretan Dutchman’s Pipe /Cretan Birthwort / Kretische Osterluzei - The English name of this strange looking plant refers to the ancient belief that it’s curved flowers referred to the shape of the foetus in the womb. It was used to help with labour pains and to ensure a swift and easy delivery. 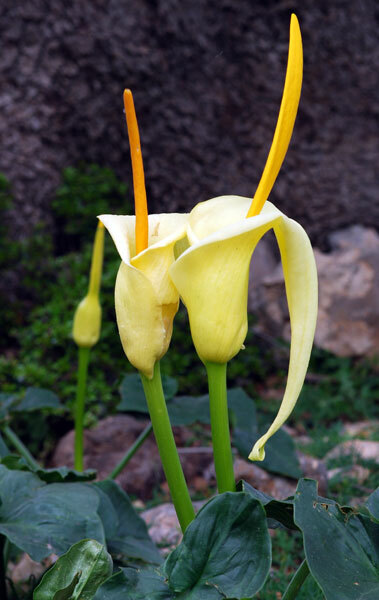 Arum creticum / Cretan arum / Kretischer Aronstab - One of the most beautiful of the arums to be found on Crete, this species is often found as a garden plant in Northern Europe and elsewhere. Often found in large groups it provides a brilliant splash of colour under old carob and oak trees. Bryonia cretica / Cretan bryony, White bryony / Rotbeerige Zaunrube - The contrast between the bryony climbing around the gnarled trunk of an old olive tree was stunning and, although the wind was blowing a gale, a little patience resulted in this passable photo. Campanula spatulata / Loffelformige Glockenblume - A relatively common campanula which is found more often in eastern Crete. Delicate flowers on slender stems. 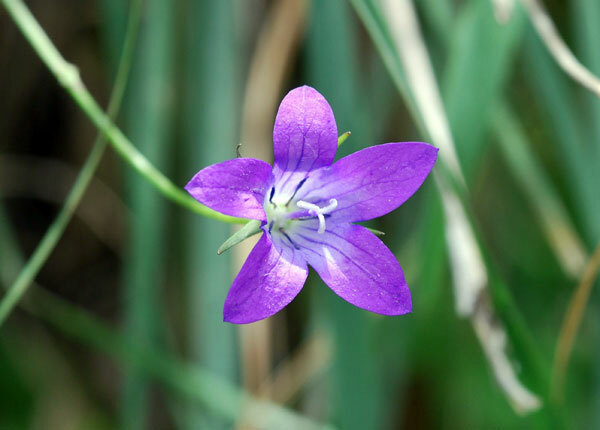 It can be found on roadsides, banks, and in meadows. 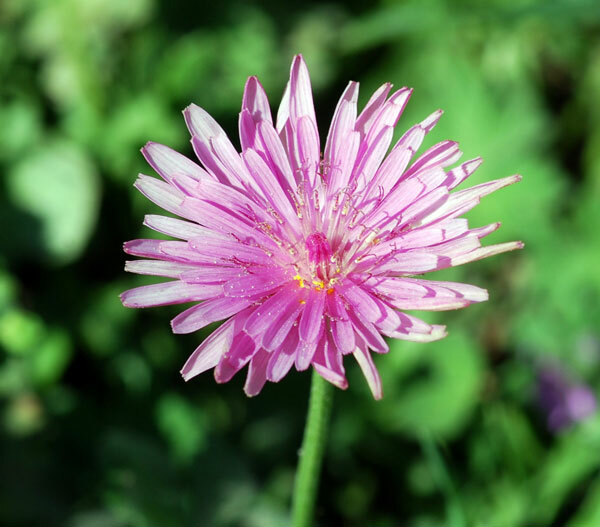 Crepis rubra / Pink hawksbeard / Roter Pippau - Although there are twenty varieties of crepis on Crete, this is the only one that is pink. 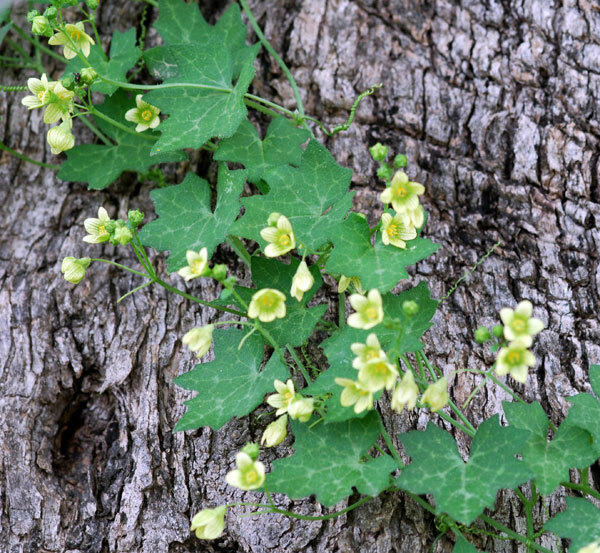 It has very distinctive flowers which are a delightful shade that stands out against grey rocks making it easy to spot. 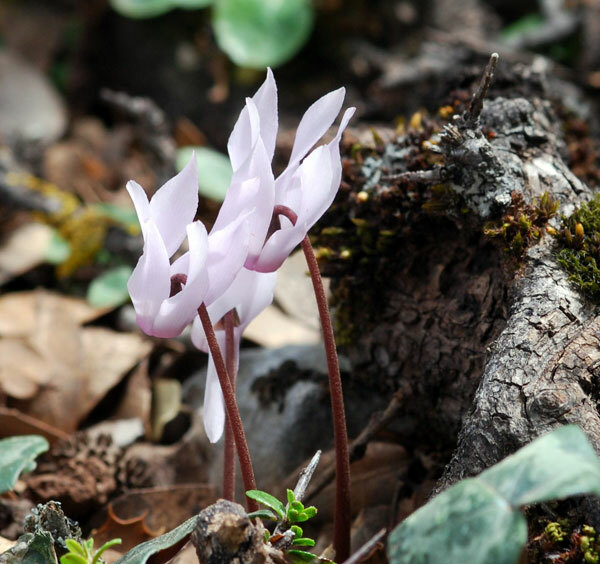 Cyclamen creticum / Cretan sowbread / Kretisches Alpenveilchen - In the mountains it is still possible to find Cyclamen creticum in flower. These were found together with Arum creticum in the forests above Kritsa.